First Listen: Los Lobos, 'Tin Can Trust' The band's latest album speaks to the experience of growing up American with Mexican roots. Inspired by the blues, rock 'n' roll and the American Southwest, David Hidalgo and Louie Perez are an adventurous songwriting team. Los Lobos' ability to fuse styles and translate vivid stories on Tin Can Trust can only come from playing for more than 30 years together. 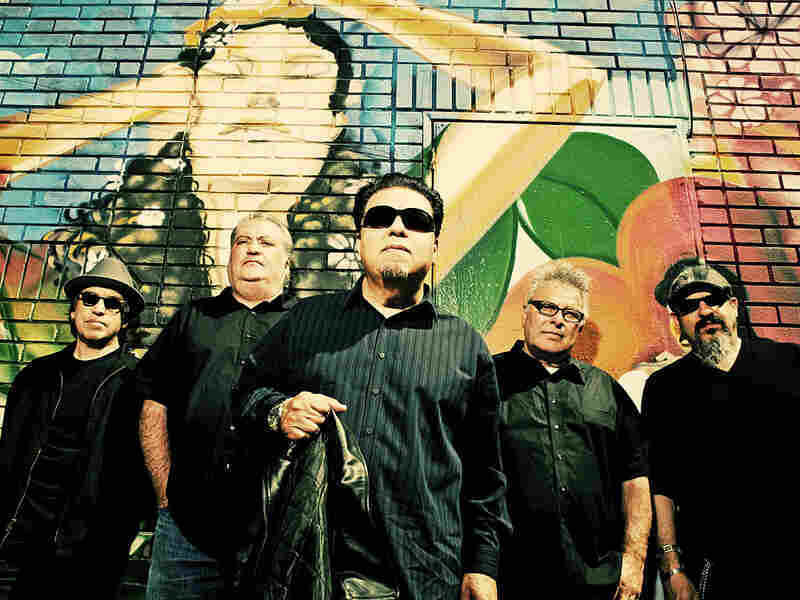 Los Lobos' latest album speaks to the experience of growing up American with Mexican roots. For many of us, it's not a long stretch from Lennon/McCartney to Hidalgo/Perez. David Hidalgo and Louie Perez have been writing songs together in Los Lobos for far longer than John Lennon and Paul McCartney ever had a chance to. I count 27 years between their first album, And a Time to Dance, and their new release, Tin Can Trust -- it's a milestone that continues to make the pair as much a favorite of mine as The Beatles. Over the more than 35 years they've been performing together, Hidalgo and Perez have composed countless songs that speak to the experience of growing up in this country with family roots in Mexico. But one of the things that set their music apart from other such cultural hybrids is their preference for rock 'n' roll. That is, rock 'n' roll that can trace its roots to the blues and other forms of traditional American music. When you throw in the preference of the band's other songwriting powerhouse, Cesar Rosas, for Latin hip-shakers like cumbias and Tex-Mex corridos, you get a near-complete sonic footprint of the American Southwest. Those musical influences combine with vivid songwriting on Tin Can Trust, and it's all propelled by the kind of playing from the rest of the band (Conrad Lozano on bass and Steve Berlin on sax) that only comes from playing together for more than 30 years. I would also call it adventurous after listening repeatedly to the last track, "27 Spanishes." The song tells the tale of the Spanish conquest of Mexico as an Afro-Cuban beat percolates underneath, complete with a David Hidalgo guitar solo that makes the hair on my arms stand up. Yes, they explain the Spanish conquest of Mexico -- and the existence of mestizo offspring like myself -- in just less than five minutes. And it works. Check it out for yourselves.